Last Sunday, I cooked the second turkey I’ve ever cooked in my life. It was also the biggest turkey I had ever cooked in my life. I wish I had taken pictures before I cooked it. It was enormous. It must have weighed 25 pounds. But to me, it was just a challenge. You see, I had done it before. It’s a just a matter of scale. How much different can it be to go from, oh, 12 pounds to 25? Turns out, you need a bigger pan. After thawing for a week in my refrigerator, I got the bad boy out, rinsed him off and prepped him for the pan. It really amazes me how one of these things can sit in the fridge for so long and still have ice crystals down inside. That clue, and the fact that the stuffing I made did not fill the cavity should have warned me that I was dealing with no ordinary turkey. But, confident in my skills, I crammed giganti-bird into my 12x24x2 pan, set the oven to 350°F and went off to church. Five hours later, we came home to smoke trickling out of the oven door. My confidence waned. A quick peek showed that, yes, something was burning, but it didn’t appear to be the turkey. In fact, the magic button had not even popped yet. Upon closer examination, I discovered that the liquid in my pan was bubbling over onto the floor of the oven. Aha! This is a problem I know how to manage! My confidence waxed. While I grabbed cup and ladle, the oven insidiously conspired against me. Having left the door open while retrieving the requisite equipment, the bottom burner decided the bird was getting a bit of a chill and needed to be warmed up. It began to glow evilly. Carefully, I ladled a scoop of the glorious bird’s juices into my cup. Excellent. Then, I went for the second scoop. What happened next is much like what happens in a Jerry Bruckheimer film at the height of the action sequences. Apparently turkeys are laced with heavy doses of napalm. (Which would explain a lot of other things if you think about it.) I jostled the ladle and spilled some of the juice onto the wicked burner. My entire visual frame filled with a raging inferno. This turkey’s ancestors had reached up from the bowels of Hell and sought to drag me into the fiery depths to endure their torment with them. I beat them back with the ladle. Alas, the story is not grim. Though the turkey’s button never popped, we did eat the fowl creature. I ripped its flesh from its bones and ground the bones into the sewer. 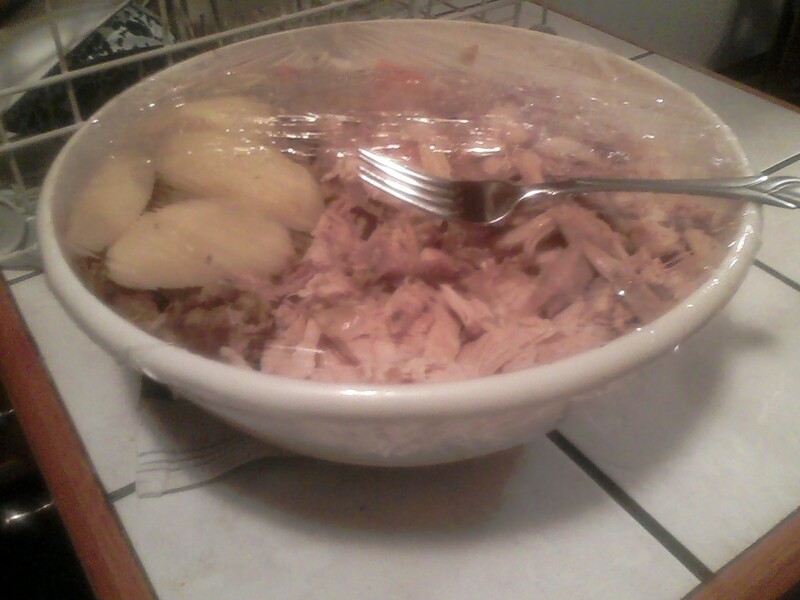 What remains is a bowl of meat large enough to feed an army for a week…or perhaps a father and son for a day or two. See the picture of the bowl. The fork is added for scale. The tiles upon which the bowl sits are 8 inch tiles. The picture really doesn’t do the magnitude justice. Unfortunately, now there is a thick layer of volatile, jellied turkey napalm on the bottom of my oven. Best not to use that self-cleaning feature just yet, I guess. Work to do. Ew. This entry was posted in uncategorized and tagged cooking, life. Bookmark the permalink. LOL! I like your story better. Angelic music played as they wheeled it down the aisle. I’ve been hanging out at a place that helps the needy. They were given 50 turkeys to distribute because the manufacturer lost power to a freezer. I saw this one and figured nobody was THAT needy. So I took it. Probably deprived a family of 12 their last meal. So, how did you actually end up getting a turkey of this size? Thanks for the applause! I vanquished my foe. Victory is sweet …errrr… meaty. Do you suppose I can sell the house before she returns? Go forth and conquer yon rotisserie! A lemon-peppered bird in the hand is worth… ah, never mind. Thanks for the comments and compliments. Three things Chris. First, I applaud you for taking on the 25-pound task. Second, I’m a little nervous for the condition of the house when Polly returns, and lastly, you have awakened my taste buds for something other than pizza and spaghetti (our planned meals for tonight and tomorrow). Perhaps just a trip to Hardings for a rotisserie chicken. By the way, besides the yummy turkey that you boys eventually, albeit dangerously, got to enjoy, I in particular, enjoyed your literary talent in describing said culinary experience.